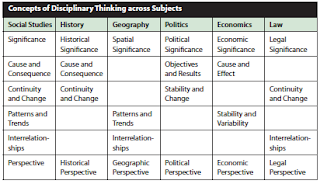 Inquiry-Based Learning: Why Teach Concepts of Disciplinary Thinking? The 2013 Ontario Revised Social Studies/History & Geography (SS/HG) document has a list of tools and strategies (p.7) that encourage teachers to shift how they might teach SS/HG. The concepts of disciplinary thinking is incorporated into this curriculum and by applying the concepts, we give students' a way to learn and engage in the material presented. It encourages them to think critically about history and challenges them to rethink the past, present and future. "... it is crucial that students not simply learn various facts but that they acquire the ability to think and to process content in ways best suited to each subject" (p.12). By moving away from memorizing facts, teachers will need to plan and promote students' inquiry to explore issues and deepen their understanding. Teaching historical thinking and pursuing challenging content knowledge will develop students' ability to "do" SS/HG. So how and why do you teach concepts of disciplinary thinking in your SS/HG classroom?